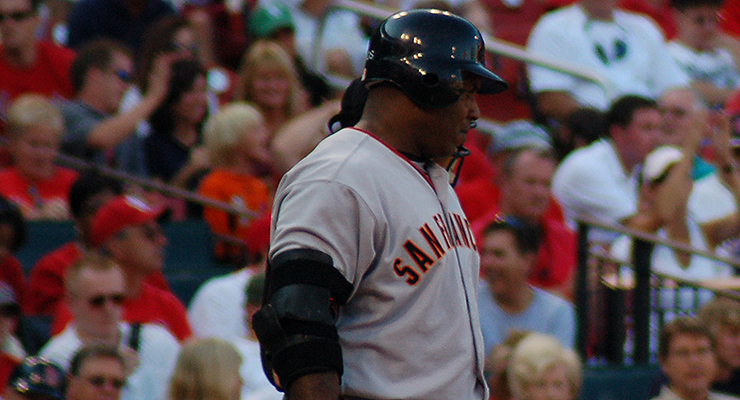 Barry Bonds’ body armor was so prevalent in 2002 that it earned its own team name (via Dave Herholz). In the Winter of 1995, I was a college student working at a campus radio station doing work I thought was incredibly important while trying to ignore the fact that we only had 100 watts of power. Our reach was extremely limited. I liked to call it “100,000 milliwatts” because it sounded so much more impressive. I was a lifelong baseball fan but never dabbled in that cult-like obsession of “Dugout Derby” in large part because I was too poor to maintain a subscription to the New York Times, and I wasn’t diligent enough to go to the library every day. The internet was a thing, and I even used Netscape Navigator at the time, which was beating up on Mosaic as the preferred tool for world-wide-webbing. One day, our news director asked me if I’d seen this website offering free “fantasy” baseball. The fantasy preface was an uncomfortable one because in 1995 most college boys associated Rachel Hunter and Elle MacPherson with such a thing. But I digress. This was about something ascribing points to things like hits, strikeouts and home runs, and it was run through a website then called Sandbox.net. And, give or take a few names, a group of us has been playing in this league ever since. Go ahead, laugh it up, fuzzball. The scoring really isn’t what this is about. If you played Sandbox, you’ll remember they went from being on top of the fantasy sports world, even acquiring then-sports stock simulator Wall Street Sports, only ultimately to go bankrupt in 2002. And the 2002 season is the one I’d like to memorialize here because, as a fantasy sports pack rat, I kept all of the trades that went down that season, and even some of the terrible offers I received. I don’t know why I did it, perhaps for mocking purposes over beverages in the offseason. Nonetheless, I have them, and the players involved turn out to be a lot of fun to reminisce about. It’s been said that nobody cares about your fantasy baseball team. It’s been said a lot, in fact. But this isn’t about my fantasy baseball team or even a fantasy baseball league. This is about a snapshot in time relative to players and their histories. These players that we coveted, some went on to have Hall of Fame careers. Others quickly became footnotes. I get some sort of nostalgic solace when I look back at these names, and it quite honestly makes me take fantasy baseball a little less seriously in the now. Our team names ranged from the clever to the odd to the downright stupid. Viva! Las Vegas Hitters, SeaTown DrawingFlies, Barry Bonds Body Armor, Smoltzy’s Ninth Inning Heroics, The Chico Salmon All-Stars, The Max Fisher Players, Spastic Colon, Triple P, Dingy Broads, Johnny Utah’s Summer of Tudor, Griffey’s Patellar Tendon, Barrio Hobbits, Where Have You Gone Rich Amaral?, and then my team, Tanqueray Greenbacks. I grade mine as pretty stupid. The fact was, I wanted Martinez badly. He was coming off a 34-HR, 113-RBI campaign with the New York Yankees, but what made him so valuable was his career 13 percent strikeout rate. In our system, strikeouts were killers, and this manager obviously knew that, taking Martinez what I saw as a few rounds too early. To ask for Martinez was probably a non-starter, so I asked for the guy who would get killed by strikeouts in Vaughn as a fallback. He wanted to know who I was willing to offer, so I dangled Kevin Millwood and Fred McGriff. Reed was 37 and had pitched miserably for the Twins after getting peddled for Matt Lawton at the trading deadline in 2001, posting a 5.19 ERA and a 14 percent strikeout rate. Moving him to anyone willing to buy seemed like a blessing, certainly in a league that over-valued wins. Reed went on to have one of his best years, winning 15 games, posting a 3.78 ERA and a 1.16 WHIP. Williams had served somewhat capably as the Pittsburgh Pirates closer for three seasons, averaging 23 saves with solid strikeouts and rotten walk rates. He was also a deadline trade in 2001, sent from the Pirates to the Houston Astros for Tony McKnight. With his new team he was generally awful, registering a 4.03 ERA (5.24 FIP), seeing his strikeout rates drop from 24 percent to just 16 percent and his walk rate elevate from 11 percent to almost 14 percent. Williams re-signed with the Pirates ostensibly to be their closer, but the red flags were everywhere. He went on to save 46 games with a 2.93 ERA and 1.22 WHIP, by far the best season in his career. Clark was a guy I always loved–just loved–to watch hit. After being selected off waivers by the Boston Red Sox in November of 2001, I was entirely convinced he was going to make the Tigers sorry for not keeping him on the payroll. 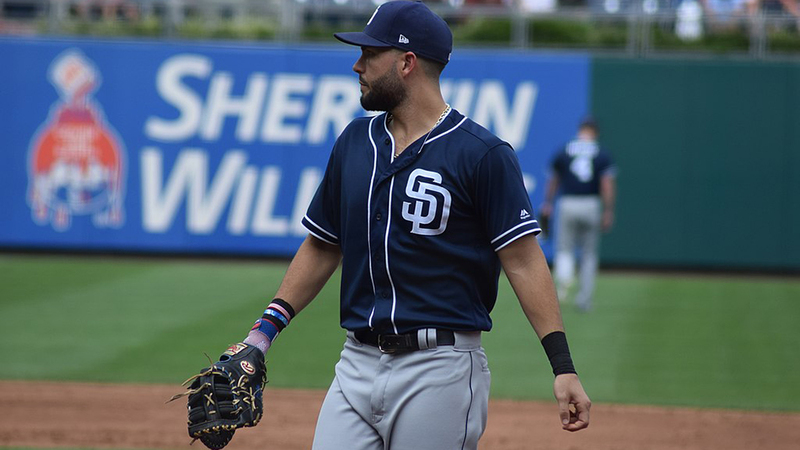 By the end of May, he was hitting .195/.248/.289 and frequently was used as a pinch hitter for the remainder of the season, amassing fewer than 300 plate appearances. He hit just three home runs that year. Jenkins, lefty masher in Milwaukee, was just two seasons removed from a 34-home run, 100-run, 94-RBI campaign. As you probably don’t remember unless you’re from Milwaukee, he started off well enough, hitting .243/.320/.444 with ten home runs over the first 67 games. Then on June 17, Jenkins took a long lead off third base, when 24-year old Roy Oswalt stepped off the rubber to keep him honest. Jenkins hustled back to the bag, planting his foot at the front of third base while the rest of his body continued with his momentum. He dislocated his ankle, tore ligaments in his ankle joint, sprained his hand, and bruised his knee. All getting back to the bag. He wouldn’t play again that season. The first trade of the season was a complete disaster for Team Tanqueray, and I’m not sure it got a whole lot better from there. Millwood was a flier pick, a kid who had some success with Atlanta but was coming off a season cut short by a labrum surgery. His strikeout rates for three years had gone from 22 percent to 18 percent to 16 percent. Millwood went on to go 18-8 for the Braves, with a 20 percent strikeout rate, registering a 3.24 ERA and 1.16 WHIP. We had our first major blockbuster of the early season. Rolen, Ramirez, and Garciaparra all went on to have All-Star seasons. The other part of the deal didn’t work out so well. This being a league among Northwest-raised kids, there was reason to be excited for Cirillo, as he was the big offseason acquisition of the Seattle Mariners, coming to save the team from a litany of third base disappointments, including Russ Davis and David Bell. Cirillo was a two-time All-Star and widely regarded as one of the best hitters in the league. He was coming off a .313/.364/.473 season in which he hit 17 home runs, driving in 83 while stealing 12 bags, and rarely striking out. Cirillo went on to hit .249/.301/.328 with just six home runs and 54 RBI, and he was readily available on the waiver wire by the break. Zito won the Cy Young award, winning 23 games and posting a 2.75 ERA (although nerds will note that his FIP was near 4.00 that season). Ortiz was still in Minnesota, and so you’ll recall he wasn’t quite yet good. Ishii was a WHIP killer. On April 26, 2002 team “The Max Fisher Players” sends Junior Spivey to team “Where Have You Gone Rich Amaral?” for Josh Fogg. Spivey finished with a .301/.389/.476 slash line with 16 home runs, 78 RBI, 103 runs scored, and 11 stolen bases–his best season by far, and perhaps his only good one. Fun footnote: Spivey was part of one of the largest two-team trades in the aughts: The Arizona Diamondbacks sent Spivey with Chris Capuano, Craig Counsell, Chad Moeller, Lyle Overbay, and Jorge de la Rosa to the Milwaukee Brewers for Shane Nance, Richie Sexson, and Noochie Varner. No, Noochie never made it to the show. Lieber wouldn’t make it to August, having Tommy John surgery. He’d never be the same. From May 15 on, Tejada hit .318/.366/.529 with 28 HR and 109 RBI. On May 16, 2002 team “Barrio Hobbits” sends Jeff Cirillo to team “SeaTown DrawingFlies” for Randall Simon and Rick Reed. If memory serves, team DrawingFlies was enduring the Fernando Tatis implosion project, and he was looking for a buy-low candidate to pitch in at the hot corner. So he dealt the aforementioned Reed along with Simon for a third baseman who was no doubt a black hole for a precious several weeks. An ostensibly healthy Prior won another five games with a 3.44 ERA. Salmon absolutely caught fire, hitting .305/.388/.520 with 14 HR and 57 RBI. Rodriguez would play 96 games for the rest of the season, slashing .325/.364/.573 with 19 HR, 64 runs, and 55 RBI. He even stole five bags. Nunez lost his job to Braden Looper. Eckstein actually tied Garicaparra for 11th in the MVP balloting in 2002. From July 11 on, Koch saved 24 games out of 26 chances and lowered his ERA to 3.18. If you recall, Weaver was the ace of the Tigers staff, but considering they were on pace to lose over 100 games, they needed to attempt to build their system back up, and Weaver was their best, and perhaps only, chip. He was dealt to the New York Yankees, who sent Jason Arnold, John-Ford Griffin, and Ted Lilly to the Oakland Athletics, who sent Carlos Pena, Jeremy Bonderman, and Franklyn German to the Tigers. The 24-year-old rookie Harang went on to post a 7.41 ERA, allowing a .280/.391/.455 slash line. He had no control and struck out hardly a soul. Lopez won three more games. Lawton was on the waiver wire within weeks. This would be the last trade of the season. Gagne had a 2.11 ERA, holding opponents to a .173/.214/.303 slash line, amassing 40 saves by mid- August and striking out 36 percent of would-be hitters. In just 20 more appearances, he’d save another 12 games, striking out 34 batters in 22.1 innings pitched. Morris made seven starts for team Tanqueray, winning four times in fairly unspectacular fashion, allowing a .309/.346/.429 slash line and striking out just 13 percent of batters. Six weeks later, the league ended, prizes were distributed, and virtual hands were shaken. There might have been a little name-calling, but it was all in good fun. In the weeks following, we would hear of the possibility of Sandbox going to a pay-only site, and then we received the notification from Sandbox that their online doors were actually shuttered, which seemed nearly impossible given their boast of four million-plus users. I don’t personally know anyone who worked for Sandbox, but I tend to romanticize their demise in a “Bringing Down the House” or “Wolf of Wall Street” kind of epic tale of excess and equally volcanic collapse. Because to this group of fresh faced Gen-X’ers, Sandbox.net was fantasy baseball, it wasn’t just providing a platform. In hindight, perhaps it was impressive Sandbox survived the dot-com bubble for so long. We played seven consecutive years of Sandbox fantasy baseball, so none of us knew anything different other than a scoring system that rendered players like Jim Thome, Dean Palmer, and Jay Buhner virtually useless because of their strikeout rate. Our scoring system had the same mentality at the time as the Baseball Writers Association of America (and, of course, a goodly portion of them still exist), ascribing premium value to the win and the save. Our knowledge of counting stats was collectively very good. Our understanding of value was not. In that sense, maybe we had something in common with Sandbox. Retrosheet had just begun going to exclusively online content after publishing its last newsletter in 2002, but sabermetrics would be a very foreign concept to this group for many years to come. Perhaps for this reason, we took a very similar putrid scoring system over to Yahoo!, and there it has been ever since. We have cycled through a handful of managers, as jobs or kids or, ahem, wives have taken them away from fantasy baseball. Many of us have evolved into additional leagues, keeper leagues, dynasty leagues, 5×5 Rotisserie leagues, 12×12 Roto, league-only formats, and yes, even Sabermetric scoring leagues. But by and large, this is our bragging rights league, and we’ve had core members for 20 seasons now. A couple of us even still call it the Sandbox league. In that time span, most of the players mentioned above followed what we know now as the infamous aging curve and flamed out. Also in this time span, the little radio station we worked for went from 100,000 milliwatts to 600,000 milliwatts, meaning you could hear it for about another mile. But almost everyone has since forgotten Sandbox.net. And still nobody cares about your fantasy baseball team. Sandbox was the first site I ever played fantasy baseball on. I remember picking up this multi-eligible player named Albet Pujols. Nobody cares about your fantasy baseball team. I still remember starting David Cone for his perfect game in my sandbox league. I think he personally racked up over 100 points that day. Bonus for win, complete game, shutout, no hitter, and perfect game. I still have my sandbox.com pint glass! Great memories of the early days of online fantasy.